Price: £3.20 (incl VAT) Sorry, this item is currently unavailable. Click here to receive notification when this product comes back into stock. Seven secure individual pill boxes with a different colour for every day of the week. The individual compartments can slide neatly and securely together allowing you to use the pill box in the order and size that suits you best. Can be joined or separated. 7 Different coloured pill boxes. Always store your medication and pill reminder in a cool dry place away from sunlight and direct heat sources. Clean in warm soapy water only, rinse well and dry thoroughly. Keep pills and medicines away from children at all times. Thoroughly inspect all parts of this item before 5the first use and before each subsequent use to ensure that there are no defects, signs of wear or foreign particles. Replace the entire unit immediately if any parts become worn or damaged, or if any compartment fails to close securely. Product code: SA8389 Price: £3.20 (incl VAT) Sorry, this item is currently unavailable. Click here to receive notification when this product comes back into stock. 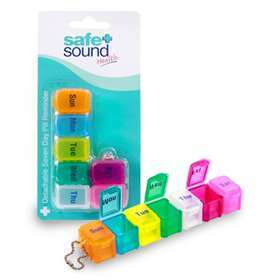 Safe + Sound Safety Pins - Assorted Sizes 24 Pack. Safe + Sound Non-Contact Infrared Talking Thermometer.